Do Sprinters Run on Their Toes? If you run on your toes, you can’t sprint at maximal speed. To describe sprinting form in a way that’s comprehensible is a tough nut to crack. Olympic coach Tom Tellez summarized the complexity of speed and acceleration, according to Bill Foran’s book “High-Performance Sports Conditioning.” Many sprinters feel they have to keep low and pull to run fast. The human body is built to push, not pull. If you stay relaxed and upright and push against the ground, you’ll run faster. However, the pushing action on a sprint doesn’t come from your toes but from the ball of your foot. When you run, your legs move through three phases -- drive, recovery and support. During the drive phase, your foot touches the ground. In the recovery phase, your leg swings forward and clears the ground. During the support phase, your weight is on your whole foot. The objective of the drive phase is to get a maximal push off the ground, which will increase your stride length. Compared to your heel or toes, the ball of your foot is the only part that can push with enough power, according to Foran. If you push from your toes, you lose stability and power. When your foot hits the ground, you plant the ball of your foot on the ground and then roll off your toes. In the recovery phase, your foot cycles through and approaches your body. Your knee opens, straightening your leg. Your foot nears the ground, preparing for the next phase. Your leg should stay relaxed. Your foot should hit the ground in a relaxed way without pounding or stamping. As you move into the support phase, your foot contacts the ground on the outer edge of the ball of your foot. How high or low on the ball of the foot you strike depends on your speed. If you’re running fast, you’ll hit a high point on the ball of your foot. If you’re jogging, the contact point shifts toward your arch and heel. If you’re running long distances, you plant your foot flat on the ground to conserve energy. Regardless of how fast or slow you run, your heel will make contact with the ground. 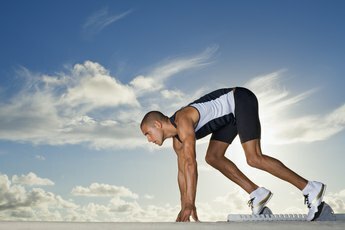 When you’re sprinting at longer distances, you can use a technique called kick sprinting. Use this technique toward the end of a race to lengthen your stride. When you kick sprint, you push forward off your toes and kick the leg forcefully forward. This technique contrasts with that of hard pumping, which focuses on lifting your knees high and pumping your legs up and down in shorter strides. These end-of-race techniques, however, are used for short distances to help a sprinter break through the tape first. If you see a sprinter pointing her toes down or outward like a dancer, her form is flawed. 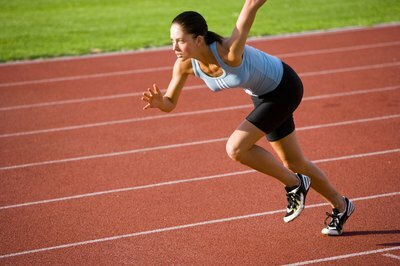 When you sprint, you need to lean forward at about a 45-degree angle to the ground. This position puts extra stress on your quads. You need to produce maximum force or you’ll lose your balance and topple over. The only way to maintain your balance is to do the exact opposite and point your toes upward. By doing so, your lower legs will contract in response to flexed ankles. 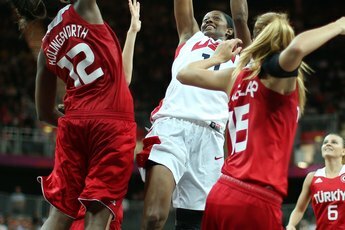 The tension in your lower legs then helps you rebound on each stride. How Do Sprinters Run on the Balls of Their Feet? How Should You Land on Your Foot When Running? Do Calf Raises Help You Run Faster?